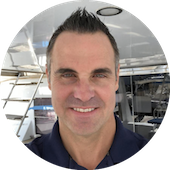 After interviewing several Yacht Brokers my wife and I selected Jim and Just Catamarans to sell our boat ‘Anything Goes’ a 42-foot Manta Catamaran and we were very satisfied with the service he provided in March 2018. First, he put us in contact with a company that arranged for our boat to be docked behind a home in Fort Lauderdale at substantial savings compared to local marinas. Then he picked us up and brought us to the car rental company about 30 minutes away. Immediately upon signing the brokerage agreement, he had our boat listed on ‘Yacht World’. Whenever we had any request or question, he was responsive and helpful. Within 3 weeks he had a buyer from another brokerage. He personally showed AG to this buyer and negotiate a selling price. Then he accompanied the buyer and surveyor on a sea trial that lasted the entire day. Afterward, he negotiated a concession with the buyer and closed the deal. Even then he was not done. He made sure the closing process went smoothly and quickly. It’s because of this personal service that we would recommend Jim to any individual selling their boat.